Paper Craft Interiors, Inc. has been providing professional paper hanging services to Chicagoland since 1977. Steven Kaye, Owner of Paper Craft Interiors, Inc.
Steven Kaye, owner of Paper Craft Interiors, Inc. is a graduate of the US School of Professional Paperhangers, and a member of the Wallcovering Installers Association, or the WIA/NGPP (formerly the National Guild of Professional Paperhangers). Additionally, he is one of the few certified members of the WIA/NGPP and has won numerous installation awards. Steven has served his organization ( WIA/NGPP ) as a local chapter officer and as a national officer. 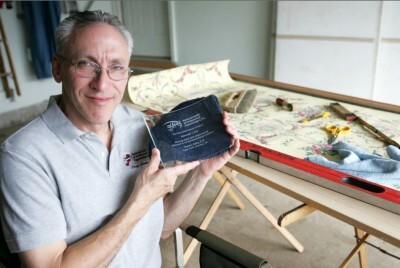 Paper Craft Interiors, Inc. has earned a reputation for quality service and superior craftsmanship due to Steven Kaye’s dedication to continuous education and training. Our extensive skills in wallcovering installations include fabrics, grass cloth, multiple patterns, silks, and hand painted and digital murals. Paper Craft Interiors, Inc. services residential and commercial clients throughout the Chicago area. References will gladly be provided upon request. We carry liability and workers’ comp insurance. For more information about our services or to schedule an appointment, please feel free to contact us. We look forward to hearing from you.